The MACH 6 is a full color inkjet printer that can put beautiful, crisp images on envelopes and mailers up to 10.5”W x 17”L and up to 3/8” thick (think padded envelopes, flat boxes and packaging). It is a revolutionary product for print shops and in-plant printing operations. Taking our Memjet print technology to the next level, the MACH 6 builds on the legacy of value created with the MACH 5 and opens up new applications and markets. ​With exceptional technology from Memjet, The Mach 5 Digital Color Printer is unlike any other envelope printer in its class. It’s fast, reliable, AND it will boost your return on investment. You will ask yourself how your business ever survived without it! The Mach 5 is capable of printing full color at 6 inches per second and an amazing 1600 x 1600 dots per inch. The faster option is 1600 x 800 dpi at 12 inches per second which still produces a clear image. This means you will be producing up to 9,000 pieces per hour! The Mach 5 clearly wins out over the 1200 dpi at 3,000 pieces per hour of LED or laser printers. That’s because Memjet packed five ink channels (Cyan, Yellow, Magenta, Black, and Black) into the single 8.77” wide print bar. Inside these channels is a whopping 70,400 nozzles from which the ink is sprayed onto the substrate. If you want a cost-efficient machine, the Mach 5 is just that. The five ink tanks each hold 250 mL of ink for long job runs and low cost per piece. If your business is looking for a machine that will produce short runs, the Mach 5 is perfect for that as well. Print what you need, when you need it. It will eliminate outdated cardstock and free you up on storage. ​The Mach X Digital Color Label Printer is the perfect production solution for efficient modern label printing needs. You can produce brilliant full color on rolls up to 9" wide and 10" in diameter. It is a fully digital inkjet label printer and it's the answer to your label printing needs. No setup costs, no plates, no production minimums. Print labels for almost anything you can imagine: wine, snacks, tools, household products, you name it. The great thing about this label printer is that it allows you to print short runs so you can save time and money on stock and also eliminate waste from outdated stock. The ColorMaxT4 Digital Color Multimedia Printer produces outstanding professional-quality output, up to 50 pages per minute. Revolutionary multi-level LED print heads control the amount of toner applied to each 1200-dpi dot, preserving fine image detail for even printing across the entire document. Dry-toner based printing is durable enough for envelopes to withstand the elements, and with its straight feed path, high-capacity feeder and output conveyor, the ColorMaxT4 is ideal for printing envelopes of all sizes. It easily handles 360gsm extra-thick card stock, polyester, magnetic media, transparency films and much more, in sizes ranging from 3” x 5” index cards to 13” x 52” banners. No more reliance on outside printing vendors, which can be costly, and time-consuming. With the ColorMaxT4, users can produce brilliant color-on-color or white-on-color jobs on-demand, on-site. The ColorMaxT6 Digital Color Multimedia Printer produces outstanding CMYK output using revolutionary multi-level LED print heads to control the amount of toner applied to each 1200-dpi dot, for fine detail across the entire document. High-capacity toner cartridges produce up to 38,000 pages, using dry toner which is durable, and ideal for envelopes to withstand the elements. The ColorMaxT6 has the ability to print CMYK plus White or Clear toner in a single pass. Using white toner allows users to print color-on-color and white-on-color, producing text and images that virtually pop right off the page. Clear gloss toner produces watermarks and artistic embellishments that simply can’t be ignored. It only takes a few minutes to switch the fifth station from White to Clear gloss toner, and back again. 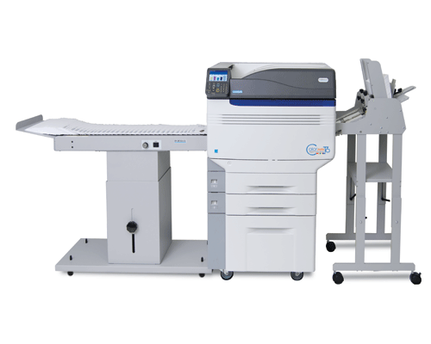 Designed with a straight feed path, envelope feeder and output conveyor, the ColorMaxT6 provides Clean Sheet print technology, making it ideal for printing envelopes of all sizes. Printing at up to 50 pages per minute, it can handle a variety of stock, up to 360gsm, in sizes ranging from 3” x 5” index cards to 13” x 52” banners. This flexibility provides the ability to create envelopes, banners, mock-ups, stationery, invitations, brochures, and more.